The audioOscillator System object™ generates tunable waveforms. Typical uses include the generation of test signals for test benches, and the generation of control signals for audio effects. Properties of the audioOscillator System object specify the type of waveform generated. Create the audioOscillator object and set its properties. osc = audioOscillator creates an audio oscillator System object, osc, with default property values. 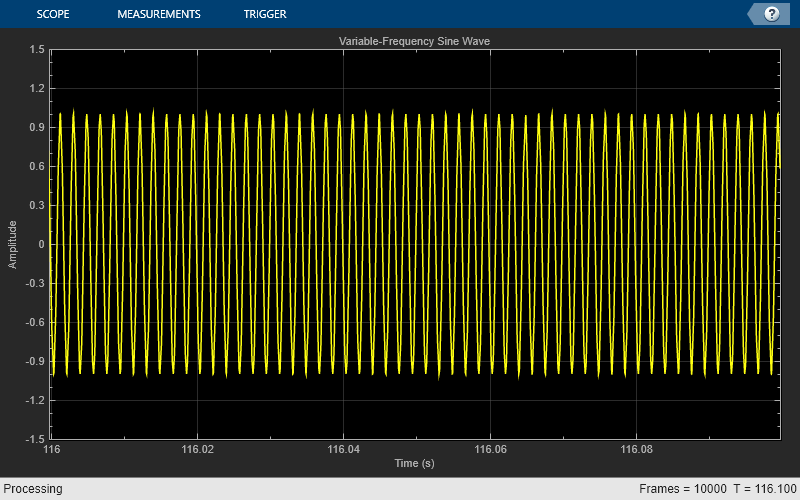 osc = audioOscillator(signalTypeValue) sets the SignalType property to signalTypeValue. osc = audioOscillator(signalTypeValue,frequencyValue) sets the Frequency property to frequencyValue. osc = audioOscillator(___,Name,Value) sets each property Name to the specified Value. Unspecified properties have default values. Example: osc = audioOscillator('SignalType','sine','Frequency',8000,'DCOffset',1) creates a System object, osc, which generates 8 kHz sinusoids with a DC offset of one. Type of waveform generated by your audioOscillator object, specified as 'sine', 'square', or 'sawtooth'. The waveforms are generated using the algorithms specified by the sin, square, and sawtooth functions. Frequency of generated waveform in Hz, specified as a real scalar or vector of real scalars greater than or equal to 0. For sine waveforms, specify Frequency as a scalar or as a vector of length NumTones. For square waveforms, specify Frequency as a scalar. For sawtooth waveforms, specify Frequency as a scalar. Amplitude of generated waveform, specified as a real scalar or vector of real scalars greater than or equal to 0. For sine waveforms, specify Amplitude as a vector of length NumTones. For square waveforms, specify Amplitude as a scalar. For sawtooth waveforms, specify Amplitude as a scalar. The generated waveform is multiplied by the value specified by Amplitude at the output, before DCOffset is applied. Normalized phase offset of generated waveform, specified as a real scalar or vector of real scalars with values in the range [0, 1]. The range is a normalized 2π-radian interval. For sine waveforms, specify PhaseOffset as a vector of length NumTones. For square waveforms, specify PhaseOffset as a scalar. For sawtooth waveforms, specify PhaseOffset as a scalar. Value added to each element of generated waveform, specified as a real scalar or vector of real scalars. For sine waveforms, specify DCOffset as a vector of length NumTones. For square waveforms, specify DCOffset as a scalar. For sawtooth waveforms, specify DCOffset as a scalar. Number of pure sine waveform tones summed and then generated by the audio oscillator. Individual tones are generated based on values specified by Frequency, Amplitude, PhaseOffset, and DCOffset. To enable this property, set SignalType to 'sine'. Square waveform duty cycle, specified as a scalar in the range [0, 1]. Square waveform duty cycle is the percentage of one period in which the waveform is above the median amplitude. A DutyCycle of 1 or 0 is equivalent to a DC offset. To enable this property, set SignalType to 'square'. Sawtooth width, specified as a scalar in the range [0, 1]. Sawtooth width determines the point in a sawtooth waveform period at which the maximum occurs. To enable this property, set SignalType to 'sawtooth'. Number of samples per frame, specified as a positive integer in the range [1, 192000]. This property determines the vector length that your audioOscillator object outputs. Sample rate of generated waveform in Hz, specified as a positive scalar greater than twice the value specified by Frequency. Data type of generated waveform, specified as 'double' or 'single'. waveform = osc() generates a waveform output, waveform. The type of waveform is specified by the algorithm and properties of the System object, osc. Waveform output from the audio oscillator, returned as a column vector with length specified by the SamplesPerFrame property. Use the audioOscillator to generate a variable-frequency sine wave. Create an audio oscillator to generate a sine wave. Use the default settings. Create a time scope to visualize the variable-frequency sine wave generated by the audio oscillator. Place the audio oscillator in an audio stream loop. Increase the frequency of your sine wave in 50-Hz increments. Tune the frequency of an audio oscillator at regularly spaced intervals to create a melody. Play the melody to your audio output device. Create a structure to hold the frequency values of notes in a melody. Create audioOscillator and audioDeviceWriter System objects™. Use the default settings. Create a vector with the initial melody of Fur Elise. Specify the note duration in seconds. In an audio stream loop, call your audio oscillator and write the sound to your audio device. Update the frequency of the audio oscillator in noteDuration time steps to follow the melody. As a best practice, release your objects once complete. Create a low-frequency oscillator (LFO) lowpass filter, using the audioOscillator as a control signal. Create dsp.AudioFileReader and audioDeviceWriter System objects to read from an audio file and write to your audio device. Create a biquad filter object to apply lowpass filtering to your audio signal. Create an audio oscillator object. Your audio oscillator controls the cutoff frequency of the lowpass filter in an audio stream loop. In a loop, filter the audio signal through the lowpass filter. Write the output signal to your audio device. As a best practice, release objects once complete. For a more complete implementation of an LFO Filter, see audiopluginexample.LFOFilter in the Audio Plugin Example Gallery.